Integrates fully with your flow generator. Easily attaches and detaches according to season or need. Modular design gives you the flexibility to choose humidification when and if you need it. You can choose the humidification level you find most comfortable, via a large dial (which is easy to find even in the dark). Powered by the flow generator, so no separate power cord is required. You don't need to reset the pressure when you attach the humidifier. 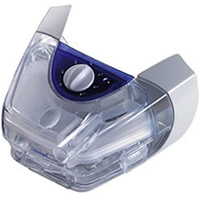 The water chamber opens completely for quick, easy cleaning – and closes securely. Electronic components are isolated from the water chamber. Not all Grey and Clear parts are interchangeable.